Conventional methods of the melanoma cancer treatment like surgery, chemo or radiation therapy may not be enough to stop the disease. Registered in 2004 in Latvia and approved by its National Health Service in 2011, the Rigvir® virotherapy is officially carried out in the Latvian clinic with inpatient and outpatient options. The team of immunologists, oncologists, and virotherapists have been exploring the potential of virotherapy since 1960. The Chief Oncologist of Latvia’s Health Ministry is also on the board which means once your application for the Rigvir® therapy is received, your case will be thoroughly examined to define whether you can benefit from it or not. For you to get answers about the Rigvir® stats, its availability, length of treatment required, and costs involved, we have outlined all the essentials here. Let’s proceed with the main Rigvir® facts. Rigvir® was first discovered in 1950s by Aina Muceniece, a Latvian microbiologist and immunologist, as a virotherapy for melanoma. Since then, the medication has been carefully researched and the medical experts concluded that it is able to cure not only eye melanoma and skin cancer, but also colon and kidney cancer, various types of sarcomas, bladder cancer and more (see the full list of Rigvir®-sensitive tumors in the next paragraph). The virus that became the basis for Rigvir® stems from the children’s digestive system. Numerous studies have proved that it has an oncolytic (fighting cancer) effect. Put simply, the naturally occuring virus infects and kills cancer cells by multiplying inside them without damaging the healthy tissues around the malignancy. The clinical trials proved that its only side effect is a slight increase in temperature (up to 37.5°C or 99.5°F). The virus does not replicate itself and can be safely combined with traditional treatments such as chemo, radio, and surgery. Thanks to its positive impact on patients’ survival rates, Rigvir® was also approved by the state authorities of Georgia (2015) and Armenia (2016). In 2016, the Rigvir® manufacturer was given a Horizon 2020 grant, the biggest European Union research and innovation funding program. This is to ensure Rigvir® will be soon widely available for the EU patients too. 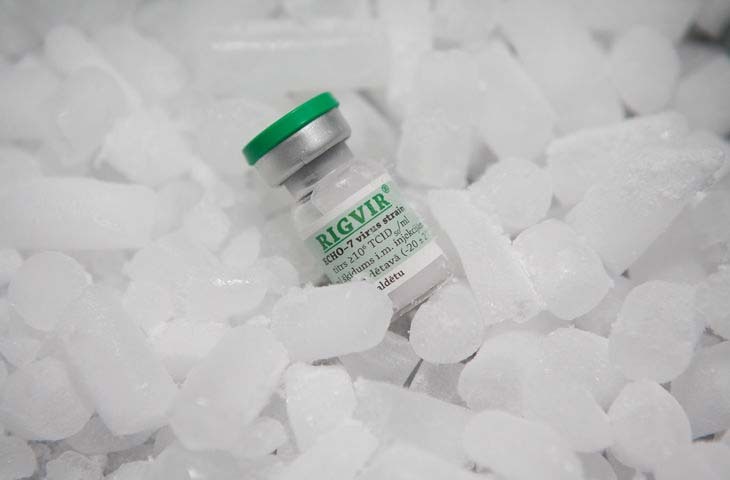 To date, Rigvir® can be shipped to any location across the globe including the USA, Canada, Australia, the UK, New Zealand. You can also learn more about virotherapy in South Africa. First off, you need to make sure the Rigvir® therapy is applicable for your cancer type. We have created a table featuring Rigvir® sensitive malignancies in the descending order in the left column. As you can see, melanoma is the most vulnerable to virotherapy type of cancer. So, your next step is to get medical files ready to apply for the treatment. On top of the biopsy report, you will need to submit four more medical documents. The entire list is provided in the right column. Upon the receipt of your request, the board of oncologists in the Latvian clinic will evaluate the case free of charge and email you back within two-three days, be it a case related to Rigvir for sarcoma or melanoma. The response will include a medical statement specifying whether Rigvir® is a suitable option for you or not. The document preparation may take from a few days to a month. So the sooner you start collecting the files, the quicker you will get the medical statement. Besides, there is no need to spend extra time translating them, since the medical personnel and patient coordinators are fluent English speakers. When planning your round trip, please also consider the ticket costs for you and someone who can accompany you. Booking them in advance may help save you a lot. Should you still have questions related to the Rigvir® virotherapy in Latvia, hit the button below to send your request and we will reply within the next 24 hours or even earlier.